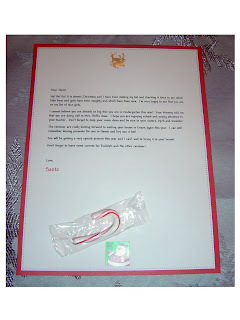 Last year, I offered to create Santa letters for all the kids in my daughter's class. It was a nice surprise for them as the teacher had them write letters to Santa and then on the day of their party, they had these personalized letters to read when they went home. This year, I offered again and although I am disappointed in the paper I found at Target, it will have to do. 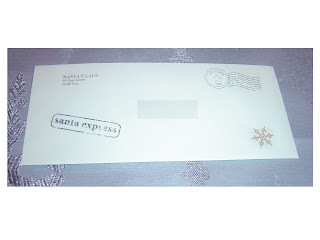 I used Picnik.com to get a Santa Express image as well as a postmark for the envelope. I also included a small candy cane on each letter. It was easy to do and a lot cheaper than buying one for each kid. I only wished the paper was better and that I had through ahead of time to find something better. If you want a free letter sent to your kids, send me an e-mail at staying_younger@yahoo.com, I'm willing to send out five for five of my readers.